A Memory Story: Penny's first airplane trip. We had the privilege of traveling to paradise (the Hawaiian island of Kauai) with my parents and sister this past week. This meant beautiful weather, fun activities, incredible scenery, family time... and thirteen hours on airplanes for little Penny Jane Griffin. I wish I could tell you that she did great on the flights, but we were not so lucky. 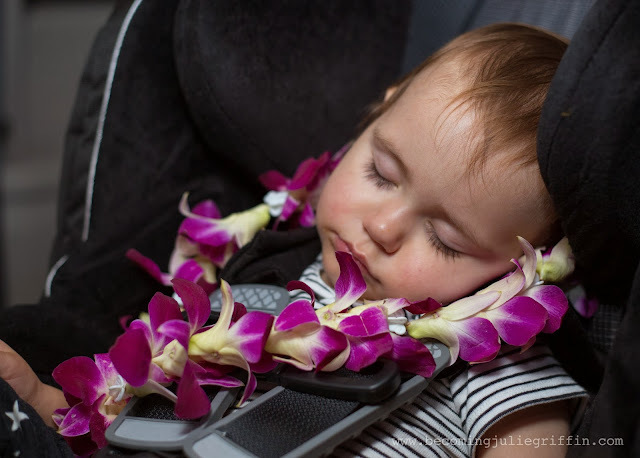 She was a perfect princess peach for about five of the seven hours on the flight from Phoenix to Kaua'i. Unfortunately, she hit a wall around nap time and FOMO / no crib / constipation prevented her from falling asleep for more than twenty minutes at a time. (Make sure your kid is NOT the least bit backed-up before traveling with them). This period of the flight accounted for about an hour-and-a-half of screaming and body-thrashing. She's freakishly strong. Not fun. Nowhere to go. In my opinion, seven hours is just too long for a toddler to be [happy] on an airplane. On the way home, fortunately the flight was only five-and-a-half hours long due to eastbound jet streams... but it was a red-eye. You know what people like to do on red-eye flights? Sleep. Which Penny did... but we did not. This flight our peanut was happy and awake for the first hour, then only cried screamed for about fifteen minutes before falling asleep for the last four hours. Super. Dan and I combined probably slept a total of 1.5 hours that night. I think I could have slept just fine with an infant strapped to me, but a twenty-something pound rag-doll in your lap (breastfeeding off and on) makes it very difficult to relax enough to really pass out. We I thought a red-eye was a no brainer for traveling with a toddler; wrong. In conclusion, while our wonderful vacation was worth the less-than-wonderful flight experiences, let the record show that I do not recommend taking an 18-month-old (regardless of sweet disposition) on a seven-hour flight (regardless of time-of-day), and that I do not recommend taking an 18-month-old (regardless of how good of a sleeper she is) on a red-eye flight (regardless of duration) if you want to get any sleep yourself. 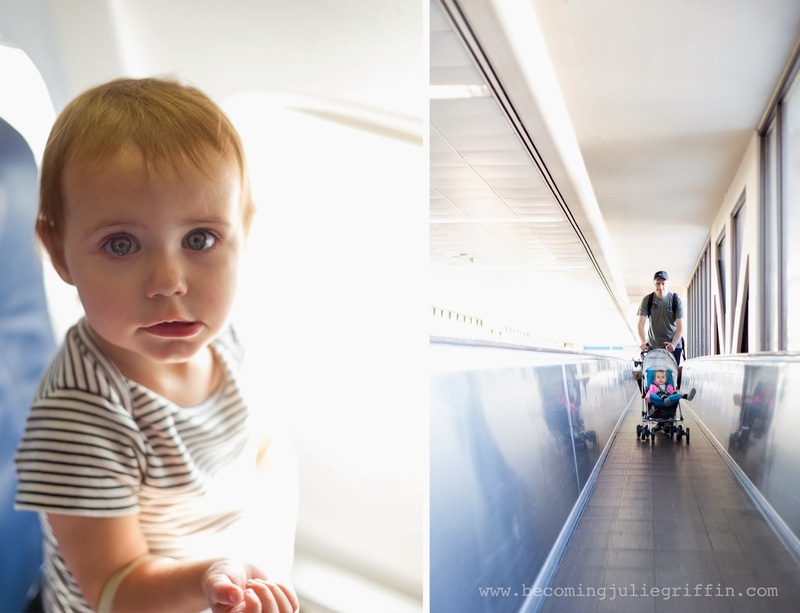 If you choose to travel with your young toddler, may you glean some wisdom from my experience flying with my [almost] 18-month-old. Penny would have done perfectly if the flights had been just a few hours shorter. Umbrella Stroller: Trust me, you'll want to have a stroller at the airport, and your big bulky one might be a pain to get through security. Good news, you can leave kiddo in the stroller all the way up to the airplane door, then you can check it at the gate for free. 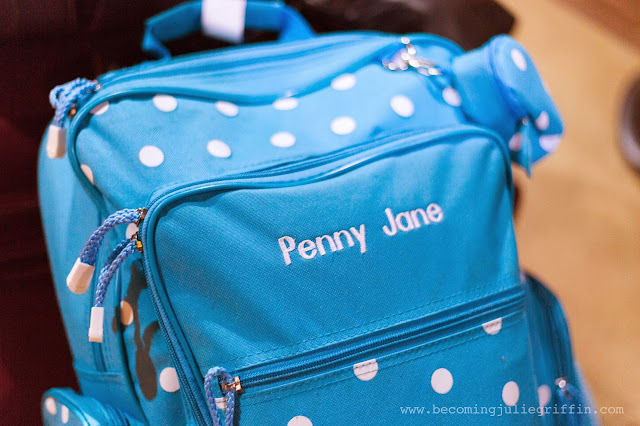 We used one of these travel bags to ensure it didn't get too dirty and to keep everything together. An empty sippy cup: You'll want something for little one to be able to drink out of when the flight attendant comes by with water and all those free juices. I don't know about yours, but my kid would have made a giant mess if we let her near those little plastic cups full of liquid. Peace offering to other passengers: For each of the eight rows around us, I prepared one ziploc bag that included a handful of hershey kisses, three-pairs of ear plugs, and this note. While I'm pretty sure most of the people around us did not utilize the ear plugs, they got a kick out of the note, and they couldn't say I didn't warn them when sweet-natured Penny screamed her head off for an hour straight. Plane-friendly activities: Pinterest has all kinds of ideas on this, but I brought a baggie full of multi-colored puff balls (like from the craft aisle), a plastic container (like from margarine or cottage cheese) with a couple holes poked in the top, and a few small paper cups. This combination of QUIET items that kiddo doesn't see every day can provide serious amusement for large chunks of time. Feeling, counting, sorting, taking in/out. And if anything gets lost or left behind, no big deal. Board books and shows on the iPad were great too (we got her these Sony headphones). Snacks: My mom was all over this one, with tupperware containers of blueberries and grapes and turkey sandwiches for everyone. We also had fruit snacks (which Penny never gets at home), miniature boxes of fishy crackers (which make her feel like she has control of fishy cracker rations), and baby food pouches (make sure to bag them with your other liquids for when you go through security). Allowing Penny to have a party with her food really killed some time on the airplane. Thanks Grammie and Grandpa! 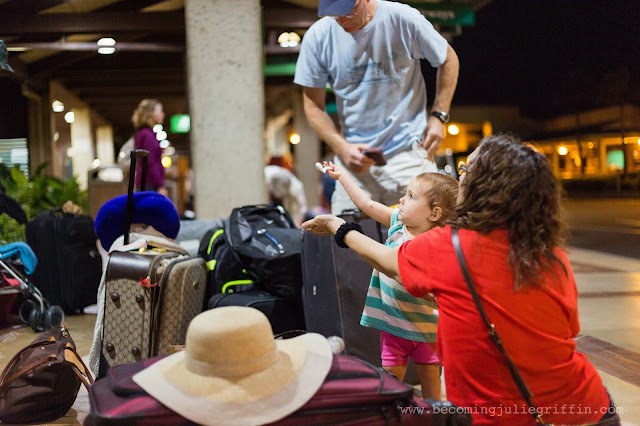 Plenty-plus-extra diapers, and a change of clothing: I have a friend who once tried to pack light then ran out of diapers at a delayed layover and had to buy some at the airport. Poor quality and super expensive, she said. Plus, what if it's an odd time of day and the airport stores are closed? Don't skim on the diapers. A pillow: There's no way Dan would have let me bring ANOTHER thing, but I would have loved to have a pillow for myself or Penny during multiple phases of our flying experience. Bring one if you can get away with it. That's our convertible car seat in the big red bag. 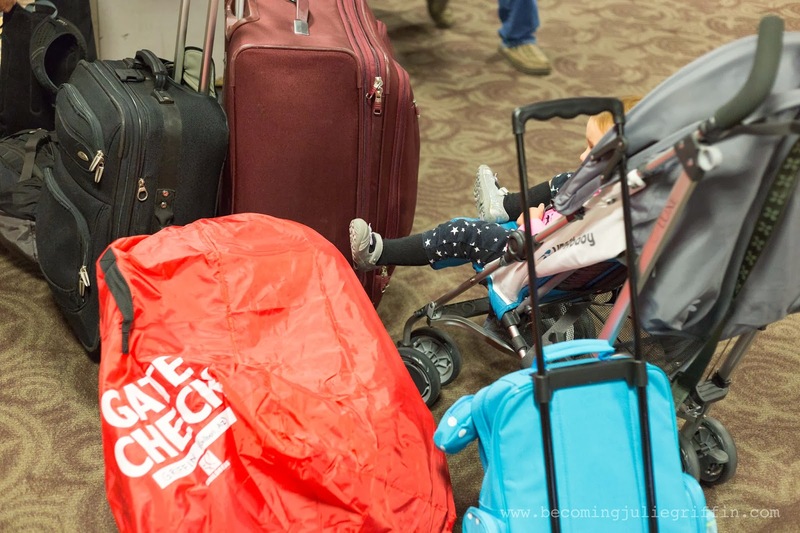 Airlines don't charge you to check car seats and strollers, isn't that nice of them? before going through Agriculture Security at Lihue Airport. Patience and Deep Breaths: My dad sitting next to me during one of our rough patches had to gently touch my arm and say "this too shall pass." As agonizing as it was being unable to control my noisy toddler on the airplane, we made it home without a scratch, we all caught up on sleep, and we are never going to see any of those people ever again. This is a wonderful story. Great tips too! Thanks for sharing! We are traveling to Maui next month. Wish us luck!